This recipe came about from the dregs of the fridge and if I do say so myself, it was goood. Seeing all those colours on the plate made me feel happy that I was eating so many veggies (I don’t know about you, but I feel perpetually guilty about not eating ough vegetables), but most importantly, it was so tasty! 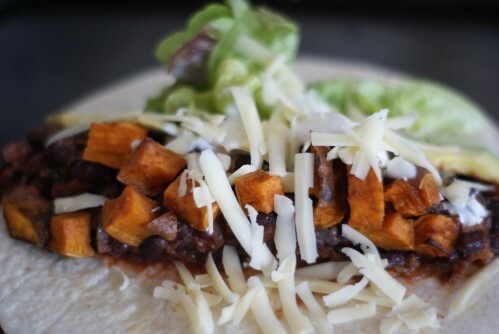 There’s something about black beans, they’re this magical ingredient that make everything delicious and the rich savouryness of the beans goes perfectly with the sweet cubes of roasted potato and creamy diced avocado. I made it again the other day, mostly because I couldn’t resist, but also to take pictures and check it was that good. Yes, they really are. Make lots of this as the leftovers are really good, especially with a fried egg for breakfast. Cut the sweet potato into 1cm cubes and tip onto a baking tray. Drizzle with olive oil and sprinkle over the cumin, paprika and salt. Use your hands to rub the spices all over the cubes. Roast in the oven for about 30 mins, stirring regularly to check the they brown evenly. Meanwhile, heat a bit more oil in a large frying pan and cook the onion for five minutes. Add the cumin seeds and black beans and fry for a minute or so, then stir in the tomatoes and coriander. Simmer for at least 5-10 minutes, or until the potatoes are cooked. Season with salt and pepper. To serve, warm your tortillas (I like to do it in a dry frying pan), spoon over some beans and potatoes then top with your favourite toppings.